Cut to the sewer hideout of our favortie mutant turtles. Leo and the boys are having a discussion and they seek out Master Splinter’s advice. It seems that the recent events have deeply troubled our heroes and they’ve decided to stop being reactive to Krang’s evil deeds and try to do something proactive to stop him. The Sensei recommends that they start with their best lead to Krang… the Shredder himself! Meanwhile, in the Shredder’s secret hideout, an extermintaor has arrived to get rid of Shredhead’s roach problem. Shredder leaves the man to his work and calls Krang on the vid screen. It seems that the vile little alien has something planned… he’s searching for something… and of course, Shredder wants in on the action! 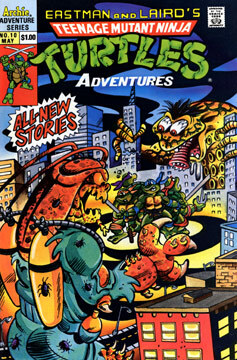 By now, the TMNT have arrived where Shredder’s sub was hidden (issue #5)… except the vessel is now missing. The Turtles decide to head down a tunnel that has lead to Shredder before, and begin their trek… unaware that a hideous giant planarian worm mutant is following them! As the ninjas head down the pipe, they end up running headlong into a giant mutated roachman! It seems that the exterminator got exposed to the mutagen and has been turned into a monster… much like the planarian worm directly in front of him!